Last night I saw a really neat cat quilt with the cat bodies as fan or dresden plate blades and the head and ears appliqued on. I didn't bookmark it and would love to find it again. It was really neat! This one is similar, but the body was more in a dresden plate blade or fan. My mom made quite a few fan quilts. Could probably take that pattern and make it. Thanks! I think I found what you are looking for. The quilter said it is a pattern from a Judy Kime book. I think you are right. It didn't look like this, but has blocks with the cat in them set up in rows. I really like the say this is done, too. Thank you so much! I found this in my photo album. Gina, you're welcome. Glad I could help! And Peggy is correct about the author's name. Thanks Peggy for helping too! I know which one you are talking about. It was on 24blocks.com. I loved it too. I would love to make it. You all got me interested! So being I didn't know how to find something on pinterest, I had put in the number that was listed and nothing happened so I just typed in cat quilt and boy oh boy there are some very interesting quilts! Fun. Such imaginations! I have the pattern you are interested in. It is in my collection at home. If it is from an online source I will PM it to you tomorrow. It is a dresden plate cat body. I planned a heart and cats quilt but never got to it. just kept the patterns together thinking someday, I will make that quilt. Thank you, feline fanatic.....I just ordered a copy...... That is such a darling pattern and I did see the quilt on FB (I think) but didn't know which of Janet's books it was in. Thanks for the link. I love cat quilts and just ordered the book! 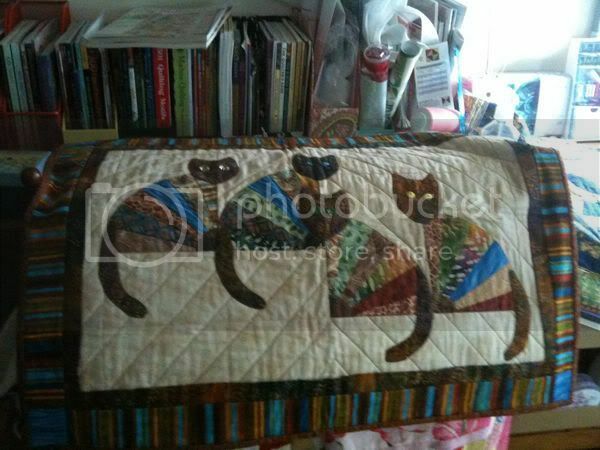 First I have seen that cat quilt. It is beautiful, great idea. Went to Amazon to order the book and amazon told me I already ordered it in 2002. Hmm - I wonder just where it could be.... I love that cat quilt. Oh my! I wish I had some service that would tell me when I've already bought something; that would sure cut down on duplicates! I'm glad someone pointed to that quilt. It's one I want to make, and I didn't know that I already had the pattern in a book. It's nicer than the one I was thinking about making. Thanks everyone for your comments and help! I have found the book on Amazon and ordered it this morning and it shipped this afternoon! You all are the greatest! I am owned by one very regal cat (at least he thinks he's the king of the house, we are just his slaves!). Thanks for posting this Pinterest site. I went from hers to another to another - and spent most of the day there! I thought I spent too much time HERE! But Pinterest is an even worse adiction. My fav sewing machine is at Pfaff USA having the circuit board replaced. Thank goodness it's still under warranty. BUT my baby is gone for 6-8 WEEKS, and I'm going nuts. I hope this Pinterest thing stops when I have my baby back again!